I was on a quest last Sunday. 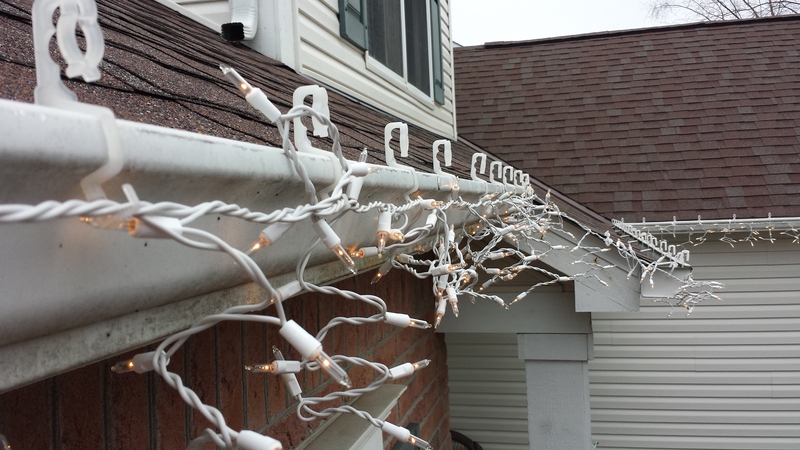 I had to seek out a new strand of white cord, clear light (not LEDs*), non-blinking icicle lights. This was because a) I had to replace a strand that I had tested prior to installing on the eaves of our humble abode (and it worked), yet after hanging them, one section of lights stopped working (arghh) and b) I was tired of troubleshooting this strand of lights with extra bulbs and fuses. I was out running another errand when I got sucked into a newly built megastore (Oh..I’ll stop in there) – Like I had a bullseye on me or something. First of all…it was as if the retail master had thrown all the quest ploys in my path. I entered the store, and had to decide to go straight ahead or turn left. I don’t know where the holiday section is here, but..just to the left, there is a token holiday light display, with the simple green string lights (white twinkling and multicolored variety), but no icicle lights. Surely there is more, I thought. I decided to turn left into the main thoroughfare and begin my descent into the labyrinth. I was met by all manners of shopping chaos, carts going across the aisle, people standing in the middle of the aisle talking…After weaving in and out of traffic, I hung a sharp right through the greeting cards and cut through the kitchen linens and was almost popped by a shopping cart rounding the corner. After exchanging apologies with the nice lady, I resumed my journey into the retail hell. In the center of stores they like to place shelves that engulf you like some sort of canyon in which you lose your way, and by some fortunate circumstance find your way back. I moved to the left towards kitchenwares and tchotchkes so that I could get a better view of the landscape. I rounded the corner just in time to see the same lady that almost plowed me over in linens. We shared an uncomfortable smile and I quickly looked for a means of navigating out of there. Scanning the horizon, I saw red placards hanging from the ceiling. Further back in the store to my left, I saw one labeled HOLIDAY. This was like some sort of heavenly sign – I swear I heard an angel choir. They placed their entire holiday section in the back, the farthest corner from the entrance, with no indication of where it was. I moved toward the holiday zone with its bustling activity, and noticed the light displays on the back wall. Cautiously peeking around every corner, I walked through the prelit tree display and found myself among a huge throng of shoppers, the likes that I have never seen in one retail aisle. The great equalizer in holiday decorating is that everyone uses lights, but everyone has different tastes in style of lights. Men, women, and children, young and old, wearing boots or slippers, fleece sweaters or jerseys, well made up or just woke up, all seeking quality holiday lighting. On one 15 foot stretch of aisleway. In the very back of the store. I quickly scanned the available products and found icicle lights, but they were only available in green strand lights and that does not match our sense of decor. Green strand lights go in bushes and trees. White strand lights hang from eaves and windows. Dejected from my lack of finding proper icicle lighting, I turned and began the walk out. To console myself I purchased a small strand of green lights on green strand (knowing that I needed an extra hundred lights for the final tree decoration in the front yard). Then, staying to the main aisles this time and moving slowly as to properly scan the intersections for oncoming traffic, I went to check out. As I waited to pay, I pondered my trek through the maze and decided that even though I had not found what I wanted/needed, the excitement of the afternoon was exhilarating. I also purchased a diet green beverage to slake my thirst. I then thanked the cashier for her pleasantness and walked out of the store. I found the icicle lights I needed later that night at a different store. But it was all about the journey. *Lest you chastise me for not choosing energy efficient LEDs, in my opinion they are cost prohibitive (in the retail sense), and only available in small strand lengths. This entry was posted in Blogroll, knowledge, Poems, poetry, prose, Uncategorized, writing and tagged chaos, Holiday, lighting, mazes, order, poem, poetry, shopping, stores, writing on December 1, 2014 by John S.